Official ProBikeKit 2018/19 replica rider race jersey made exclusively in collaboration with prestigious cycling innovators Santini. The PBK race jerseys are complete with all-over PBK branding and printed branding from our six official sponsors: Campagnolo, Selle Italia, Vittoria, Giro, Look and Santini. 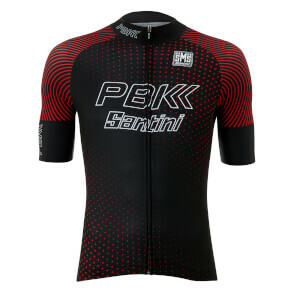 PBK Santini Rider Race Jersey short sleeve jersey, made of lightweight and breathable Think Opaco fabric and with Cyber Rider fabric on the back, with grip on cuffs and bottom to keep the jersey in place. The raw cut sleeves are made with Bodyfit fabric, an incredibly anatomical material. Long covered zip and triple back pocket to store everything you need. Ideal to increase your performance while maintaining the classic style of cycling jerseys. Smooth think fabric on the front, side, collar and pockets. Cyber rider fabric on the back, raw cut bodyfit fabric on sleeves. This is an excellent bike shirt. Very comfortable,rode 2hrs on my zwift ,sweated tonnes and shirt performed better than i did and looks better than i do too. well worth the price.